March 2014: ADI is delighted to hear that the Maltese government has just published a white paper outlining its proposed amendments to the Animal Welfare Act which includes a ban on the use of ALL animals in circuses. This move follows a public consultation on the issue last summer to which ADI made a detailed submission in support of a full ban, which has majority public support. December 2013: Circuses bringing animal acts to Malta are using the fact that wild animals in circuses could soon be banned to their advantage, securing extra publicity by billing themselves as the ‘last animal circus’. Both Circo Aquatico, whose acts include sealions and penguins, and Viviana Orfei which includes a hippo, zebras, camels and tigers, two of whom have just given birth to 6 cubs, are presently performing in Malta. ADI has recently submitted its comments on the draft circus ban, which it hopes will be extended to prohibit all animal acts. 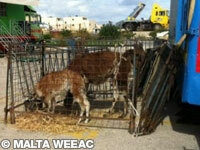 The campaign to ban animal circuses in Malta is gathering pace. It has been reported (September 2013) in the media that a White Paper on the issue has been drafted and will be presented to Cabinet in the coming weeks, with a bill expected by the end of the year.